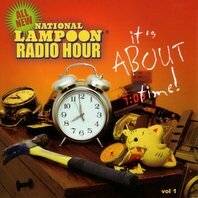 National Lampoon Radio Hour: It's About Time! Tired of waiting? Well, wait no more. 'The National Lampoon Radio Hour' is back! After years of requests, the seminal comedy radio series has returned with an all-new sketch-comedy series...and with it, for the first time, a brand new collection of the best material created since its revival. The new 'National Lampoon Radio Hour' stars legendary comedian, actor, and original National Radio Hour troupe member Richard Belzer and an all-new cast of characters and performers. Wait no more. The biggest brand name in comedy is back. And, it's about time!